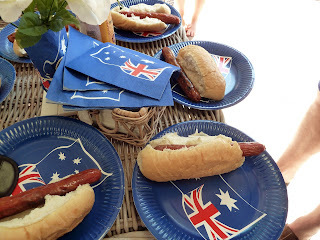 Australia Day is a public holiday here, and the nation celebrates everything Australian. All the parks are full of families playing cricket or rugby or just kicking a ball around and there has to be a bbq. We stayed at home and invited some friends over for a swim and some lunch. Let me teach you a new word for sausage - a snag! So the kids had snags in breadrolls. If we were true Aussies we would have put the snags in a piece of bread...but hey, we're still learning. The other obligatory food for Australia day is...prawns of course! Our little family rarely, if ever eat prawns so it was with some trepidation that I went to get some yesterday. How many different variety of prawns are there! and what's with the "preparing" of them? 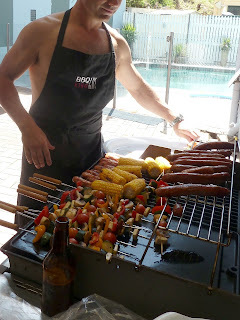 Husband did a good impression of an Australian male with complete control of the bbq and beer in hand. 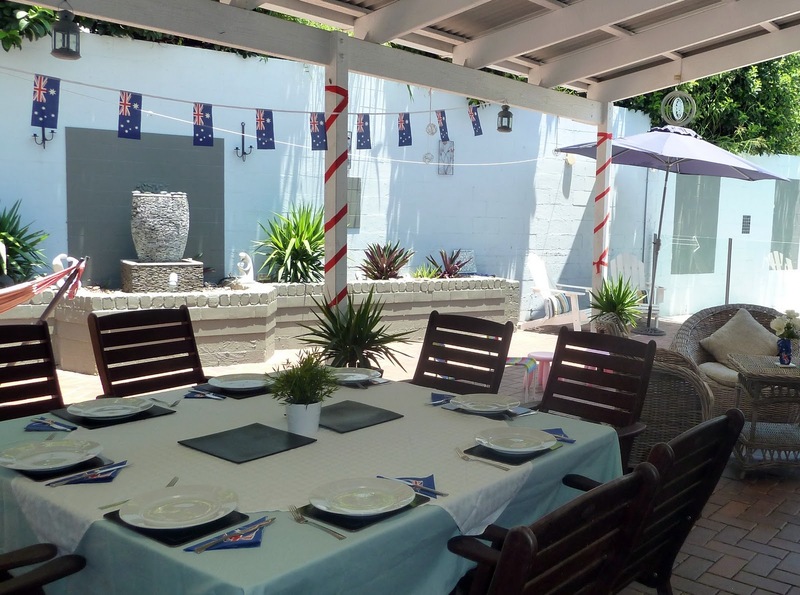 We raised a glass of bubbles to our Scottish friends who are now fully fledged Australian citizens and enjoyed a relaxing afternoon chatting, eating and watching the children having a great time in the water. oh beth- i love this post!! prawns and snags on the barbie...cooked by that very cute looking guy at the bbq!! your husband no doubt!! your patio looks brilliant all decked out...so glad you had a wonderful day! Ah...we have dear friends in Australia and I've been wanting to go visit them so bad. Now I REALLY want to!!! Whoops, I meant "I don't eat meat", not "eat eat"! !